The black and gold are off to a 7-3 start, on pace for another good season matching starts of successful VCU teams like the 2014-15 A-10 Championship team, the 2011-2012 and 2012-13 teams that both advanced to the round of 32 of the NCAA tournament and have matched the 7-3 start of VCU’s 2011 Final 4 group. But one key difference between all of those eventually successful groups and this year’s team is an incredibly high turnover rate. VCU head coach Will Wade brought up the Rams’ struggles with turnovers this season in an early-week press conference. VCU has a game goal of 12 turnovers per game, Wade said, but a reality of 15 turnovers per contest thus far — the Rams have hit their goal just three times this season. VCU turned the ball over an average of 17.3 times in their three losses this season as well as 25 times in an exhibition loss against Division II Queens University. Wade calculates VCU’s turnover struggles as giving away 6-8 possessions per game. VCU’s 21.2% offensive turnover rate ranks 280th nationally and helps negate a havoc-wreaking defense that is turning over teams 22.5% of their possessions (37th nationally). It’s the worst turnover rate for a VCU team on offense since the Rams turned the ball over 23.6% of their possessions, ironically, VCU’s Jeff Capel-led CAA Championship team that ended a seven-year NCAA tournament drought. Starting point guard JeQuan Lewis may lead the team in such passes and has seen his turnover rate rise to a three-year high his senior season to turning the ball over 24.3% of his possessions. Lewis is averaging roughly 2.5 additional minutes of play from last year’s season but has seen his assists per game dip from 5.1 last season to 4.4 so far this year. His turnovers per contest however have risen to 3.2 per game versus 2.6 last season. Melvin Johnson was far and away one of VCU’s most used players from last season’s team yet only turned the ball over 11% of his possessions. Big men Mo Alie-Cox and Ahmad Hamdy-Mohamed are both turning the ball over more than 20% of their possessions as well. Alie-Cox has seen his offensive rating dip to a career low thanks in part to a career-worst 21.4% turnover rate, up from 17.1% as a junior. Hamdy-Mohamed has played limited minutes but owns VCU’s worst turnover rate for a double-digit minutes player, turning the ball over 28.5% of possessions. Seven Rams in total have turnover rates worse than 20%. Only Doug Brooks (14.9%) and Justin Tillman (10.8%) are below that line and averaging double-digit minutes compared to seven sub-20% players from last season’s team. And that stat could be one positive sign. 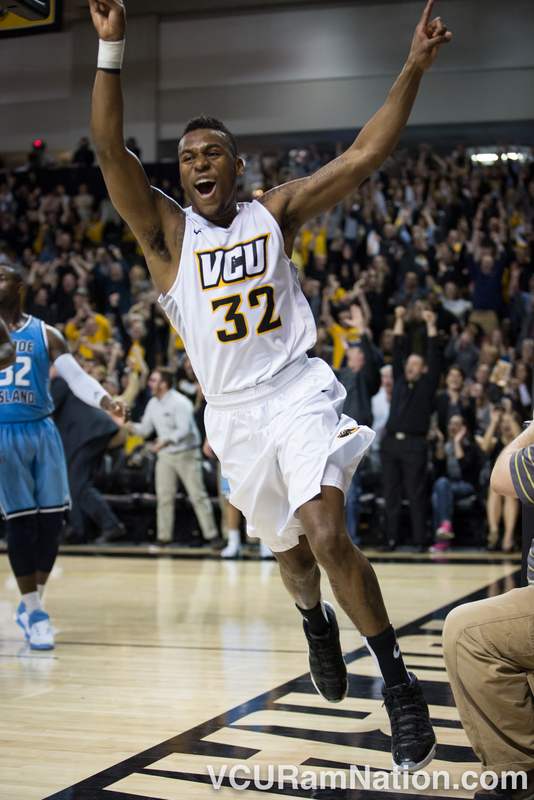 Is VCU’s 2016-17 group destine to be a turnover-heavy unit thanks to the graduation of low-turnover/high-playing time players Melvin Johnson or will the numbers from early season struggles regress to the mean? Six players on this year’s team were under 20% last season including Alie-Cox and Hamdy-Mohamed who have seen their numbers shoot up. Will Wade and Co. will hope the entirety of that group gets back on track. A huge difference in the two teams — and potentially what may prove to be the season difference — has been the production replacement of the graduated Melvin Johnson and Korey Billbury, a duo that combined for just 2.8 turnovers in 59.5 minutes per game, not to mention 28.6 points. Johnson, Billbury and little-used sophomore, Michael Gilmore (11.5 mpg), have seen their vacated minutes scattered among small increases for most returning players with the largest difference coming in increased playing time for point guard Jonathan Williams (+11.6 minutes). A large chunk of their minutes have also gone to freshmen Samir Doughty and De’Riante Jenkins. Both have turnover percentages that essentially mirror the team’s overall rating, Jenkins checking in at 21.5% TO% and Doughty at 22.8%. Jenkins however has trended in a very positive direction for the Rams in both turnovers and minutes. The top-50 recruit has just three turnovers in his last seven games, a total of 85 minutes of play. That’s after racking up five turnovers in 46 minutes over his first three games (mostly off called travels). Doughty will need to find a way to keep pace with Jenkins on that trend. The red-shirt Philly product has averaged 2.1 turnovers per game this season, second worst on the team and has the third worst turnover rate on the team if you exclude freshman Marquell Fraser who has played just 14 minutes the entire season. As the prime beneficiaries of the majority of the graduated Johnson and Billbury minutes, inheriting 59% of their playing time, both Jenkins and Doughty will need to find rates closer to that of both Johnson and Billbury. As off guards, it shouldn’t be too hard to do so, shooting for rates close to Johnson’s freshman average of 15.3%. Another obvious factor that can improve the Rams rate of turnovers is competition. VCU has played four top-100 turnover percentage defenses in their 10 games so far this season, averaging 17 turnovers per game against the group. VCU turned the ball over a season-worst 21 times against Georgia Tech as well, the nation’s 118th best turnover defense, turning teams over 20.1% of possessions. The Rams are averaging 13.3 turnovers per game against teams outside of the top-100 in TO% defense, just north of Wade’s goal of 12 per contest. Subtract the 21-turnover outlier of the Georgia Tech disaster however and the Rams are at 11.8 turnovers per game against the five remaining sub-100 turnover percentage defenses they’ve played. Things get no easier anytime soon however, as the black and gold welcome Middle Tennessee State (10-1) to the Siegel Center this Saturday. The Blue Raiders bring and improved team to Richmond from last year’s group that knocked second-seeded Michigan State out of last season’s NCAA tournament. Kermit Davis’ squad ranks 40th nationally in turnover percentage defense at 22.3%. Following that the Rams will play seven total contests (35% of remaining games) against top-100 turnover-forcing defenses, four against top-50 teams. Might want to fix the typo in your article title.